There is an annual 7 day event, usually during the first week of March, to release young turtle hatchlings, which have been raised by the Fisheries Dept., back into the sea at Thai Muang National Park beach. One of the prime objectives of the Park is to offer protection to the visiting nesting turtles and increase the survival rate of the young. Leatherback and Olive Ridley are the two main species of turtle which frequent the Park. They come ashore to lay their eggs on moonlit nights between November and April, at which time the beach is patrolled by Park rangers. For conservation and protection purposes, most of the eggs are removed by staff to a nursery. Incubation takes 60 days, after which time the youngsters are released naturally back into the Andaman Sea. The particular releasing in March is designed to heighten people's awareness of the declining numbers of nesting females and promote conservation efforts. Making Merit on New Year's Day, annually held on 1st January in front of the office of the Muang Municipality and at the multi-purpose ground of Amphur Takua Pa, the ceremony offers an auspicious opportunity to people for making their merit on the New Year's day. Light Offering Ceremony, annually held from January 8-9 at Wat Kositaram, Amphur Kakong , features local shows and sports & games. Water Melon Day is organized every year around January and February in the front yard of Kura Buri District Office. One can enjoy the water melon, a beauty contest, as well as exhibitions from local government offices, including agricultural products, and a food competition. The Ma Jor Poh Statue Procession (Chinese Goddess ldol Procession) takes place along the inner road in Nam Pud cave near the large market. It's a yearly ceremony taking place around February and March organized by the descendants of Chinese immigrants in Phang- Nga. The statue of Ma Jor Poh is carried on an ancient Chinese carriage around the town along with the weapons of various sacred spirits from the Chinese temple with traditional music played on Chinese musical instruments. Each of the spirits has got particular characteristics and they are welcomed by local people who put a table covered with a red cloth with chopsticks, sweets and fruits in front of their house. If a "spirit-carrying" person drops by and picks up a sweet and/or fruit from any house, the owner is very happy as it's believed to be a sign of good luck. In the temple, there are several ceremonies held throughout seven nights. There are also various shops and entertainment such as Talung puppet shows, Manora dances, etc. Songkran Festival, annually held on April 14 in front of the office of the Phang Nga Muang Municipality, in the Somdej Park (Suan Somdet) and also at the multi-purpose ground of the Takua Pa District Office. There are a merit making ceremonies, a water-pouring ceremony to pay respect to monks and elderly people, and many shows performed by local students. Songran is also a national festival. Wat kao Annual Festival, annually held in April at Wat Kao Charoen Tham, Tambol Krasom, Amphur Takua Thung, offers auspicious opportunity to people for making their merit. The Chao Ley (sea gypsy) Boat Floating Festival of the Morgan people takes place around April and May every year in a sea gypsy village on South Surin Island (Surin Tai island). It's a ceremony to celebrate the ancestor's spirits (Nia An Lo Pong). Morgan sea gypsies of all kinds join in this ceremony. The ceremony includes spirit dwelling, ancestor worshipping, fortune telling, music performances, dances, and "Kabang" floating which is believed to take away all sickness and bad luck from their families and community. The worshipping ceremony of Narayana and his followers, a Hindu ceremony, (Vishnu ldol Sacrifice Ceremony) takes place around May every year at Narayana Park (Phra Narai park), Takua Pa District. This displays the ritual offering sacrifices to Vishnu god and his subject gods. There are also various shops, several forms of entertainment, and activities performed by students. Fruits Fair, annually organized in July at the office of Amphur Thai Muang, exhibits the fruits contest. Local delicious fruits are available at reasonable prices. Tay Kra Chat Festival, annually held on September 13 at Wat Intha Phum, Amphur Kapong, exhibits religious activities and the offering - essentials-to -the meed-ceremony. Vegetarian Festival. The Phang-Nga Vegetarian Festival : Similar to the well-known Vegetarian Festival in Phuket, but more traditional, this festival is held from the first through the ninth nights of the ninth Chinese lunar month (ie. in September or October). Visit the Festival and street processions at Takua Pa town just north of Khao Lak. Amazing Phang-Nga Festival : High Season Opening in Phang Nga "Opening of the Amazing Phang-Nga" is scheduled in the second week of November every year. There is an opening and special events ceremony Khao Lak Center. The ceremony features entertainment, cultural shows, an exhibition of tourist attractions, water sports and local sport competitions, local products shops, and enjoy vast variety of sea food from many resort in Khao Lak. There are also special discounts for tours and accommodation to welcome in the high season. Loy Kratong , or 'festival of light' is celebrated on the night of the full moon of the twelfth lunar month (usually November). It is one of the two most widely recognised festivals in Thailand and is probably the most beautiful, picturesque and enchanting of all Thai celebrations. 'Loy' literally means 'to float', while 'kratong' refers to a small lotus-shaped floral receptacle which can float on the water. The kratong, which was traditionally made of banana leaves, (although more creative materials are also used nowadays), contains flowers, candles and incense. According to legend, the festival originated when a young princess floated a small boat laden with candles and incense downstream to take away bad luck. As the full moon rises, Thais will kneel at the water's edge, with floral kratong in hand, add a few small coins and several strands of hair, plucked from the head at the time, light the candles and incense, say a silent prayer, and then very carefully launch their kratong into rivers, canals, ponds, or the sea to wash away sins and to bless love affairs. They will watch very intently as the float drifts slowly and silently downstream, hoping that the candle will not go out. It's flame is said to signify longevity, fulfillment of wishes and release from sins. The celebration is also considered a romantic night, as couples who make a wish together on Loy Kratong are thought to stay with each other for ever in the future. Thai women dress in beautiful traditional Thai dresses for Loy Kratong. Also, as part of the celebration, nearby temples will release numerous 'khom loy' (floating lanterns) into the moonlit sky, hoping that misfortune will fly away with them. Kratongs are readily available from vendors, and everyone is extremely welcome to join in and celebrate this unique occasion - a chance to make sincere wishes and look to the future as you watch, in silence, your candlelit floral offering drift peacefully and gracefully into the distance in the gentle currents. This is a very important Buddhist lunar festival, celebrated nation-wide, and is based on the historic gathering of the Lord Buddha's disciples. It takes place during the full moon of the third lunar month (typically mid to late February) and devotees will join candle-lit processions around temples. Note that Thais use a different lunar calendar to the Chinese. The first month of the Thai lunar year takes place usually in November while the Chinese lunar new year generally occurs in February. Both systems use a solar calendar for solstice-oriented festivals but make adjustments by adding a lunar month once every three solar years. As stated under our Songkran section, the "official" Thai New Year is actually celebrated at Songkran (during the fifth Thai lunar month). The love and respect felt by Thai people for their King, His Majesty King Bhumibol Adulyadej (King Rama IX), who ascended the throne on 9 June 1946 and is the world's longest reigning monarch, is on display throughout the country every day and in particular this day, the 5th December. The occasion is marked by an outpouring of love and reverence by Thai people throughout the kingdom and around the world. The King has a special place in the hearts of the Thai people through his combination of devotion to the welfare and development of his people, and a keen understanding and awareness of political and social issues. Buildings and homes all over the country are elaborately adorned with flags, and portraits of His Majesty. Around the Grand Palace and Ratchadamnoen Avenue areas of Bangkok, thousands of vividly colored marigolds decorate the streets. People assemble on the streets with lit candles to honour their monarch. The most spectacular event is perhaps the review of massed Royal Guards by their Majesties the King and Queen at the Royal Plaza in Bangkok. Songkran is one of the oldest traditions in Thailand, and marks the "official" Thai New Year, even though it falls in the fifth month of the Thai lunar calander. There are historical, climatic and cultural reasons as to why it does not take place on the first Thai lunar month. 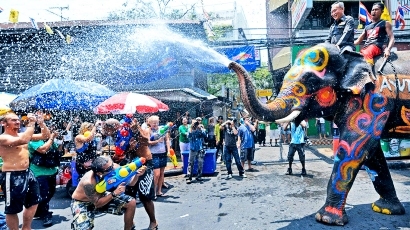 Songkran has its origins in ancient astrology and the position of the sun. It is held annually on 13th April, but can last for upto three days in some parts of the country. During this auspicious celebration Thais traditionally return home for family reunions, and visit temples, sprinkling water on Buddha images in reverence. Meeting friends and sprinkling water on each others' shoulders and hands is an act of wishing good luck. Although the tradition of gentle sprinkling in temples and homes is still practiced, Songkran has become an exuberant festival with revellers throwing water at anyone and everyone in the streets. So join in this extremely good natured fun, and cool off from the heat, but don't forget to leave cameras and all non-waterproof valuables in your room, because you are likely to get very wet. There are many ceremonies and customs associated with Songkran, Thailand’s traditional New Year Festival. 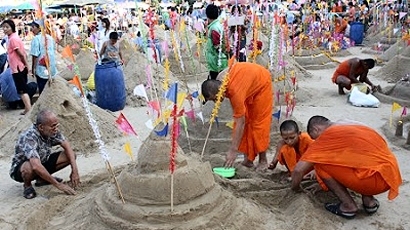 Although the festival is most well-known for the water-throwing that goes on in the streets, visitors to Thailand during Songkran may also notice mounds of sand within temple grounds. These are sometimes formed into chedis or pagodas and some temples in Thailand hold competitions which result in elaborate and beautifully decorated creations made from sand. The tradition for Thai Buddhists to take sand to their local temple at Songkran is a form of making merit. The act is a symbolic way of replacing any soil or sand that may have been removed unwittingly on the shoes of temple visitors as they have left the temple grounds on their previous trips during the year. These sand pagodas are often topped with colourful pennants or flags which may depict the animals of the Thai zodiac. Parades and sand-building competitions also take place in some locations in Thailand and it is a colourful side to the Songkran festival that is often overlooked by overseas visitors.